Here's how a five day sale helped the e-commerce industry spike revenues with Flipkart emerging victorious in this year's festive season sale. The e-tailing industry generated Rs 9,000 crore in this festive season sale. Cash burning in the e-tailing industry was expected to reach upto $ 370-400 million this year on the back of large scale discounts. Flipkart increased its market share while Amazon and others decreased. Pre-Diwali sales that concluded last week spiked revenue of e-commerce websites by 40% since last year’s sales. In the five days from September 20 to 24, during which many e-commerce websites held festive season sales gross merchandise value (GMV) for the industry reached Rs 9000 crore. “For these festive sale days, RedSeer analysis shows that the e-tailing industry managed to generate Rs 9,000 Crores/ $ 1.5 billion of sales. This is compared to $ 1.05 billion generated in 2016 edition, a y-o-y growth of nearly 40%,” the report dated September 25 said. 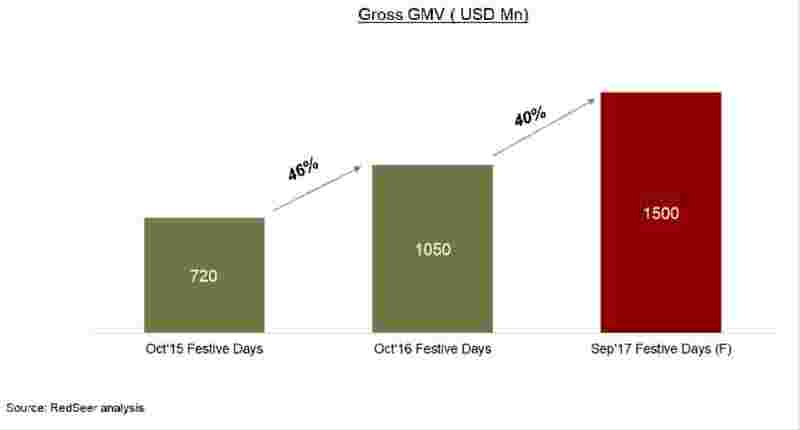 In October 2016, GMV reached $1.05 billion and was even lower at $720 million in 2015, as per RedSeer data. 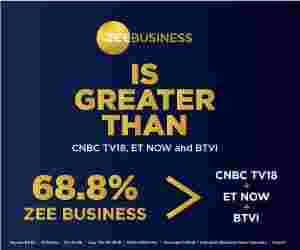 However, cash burning on the back of discounts in the e-tailing industry was expected to reach upto $ 370-400 million in 2017, up from $ 200-250 million last year (on a gross GMV of $ 1.05 billion), RedSeer said. RedSeer also shared how the market shared between the top players looked like in 2017 sales vs 2016 sales. In the 2016 festive days Flipkart garnered 50% market share during the sale days. This increased to 58% in 2017. While Amazon dropped in market share during this year’s festive season sale. 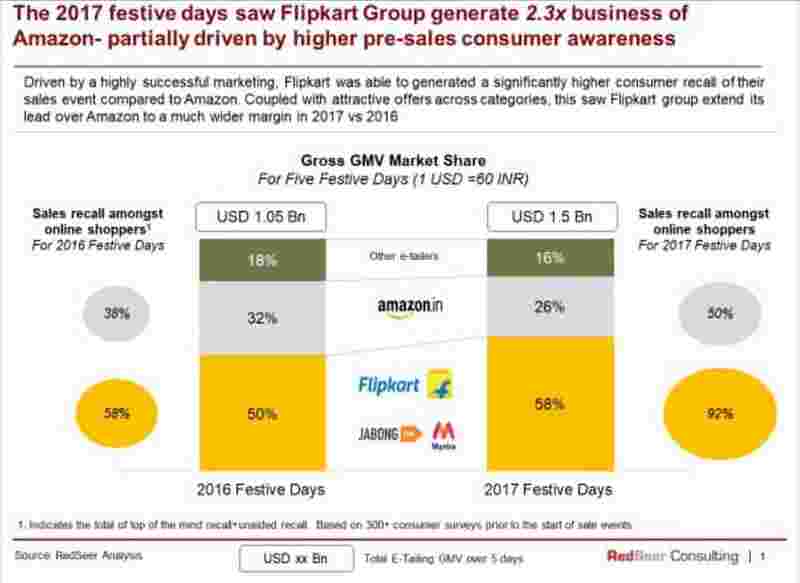 “Nearly 80% respondents plan to purchase products this festive season- with Flipkart being the clear preferred platform across all categories,” an earlier report by RedSeer said. Amazon on the other hand said that more than 50 % of categories doubled over last Diwali. “We are humbled that the latest version of the Great Indian sale was our biggest shopping event ever, with remarkable growth across categories led by Smartphones and Large Appliances growing multiple times vs last year. We are especially excited about growing e-commerce in India with more than 85% of new customers from small towns.” said Manish Tiwary, Vice President - Category Management, Amazon India. Market share of other e-tailers also dropped to 16% in 2017 season sale. Significantly higher consumer recall of online shoppers was recorded by Flipkart than Amazon. Higher than ever awareness of sales amongst online population- motivating them to come online in highest ever numbers. Strong offers across categories, especially on electronics- converting the visitors to shoppers in large numbers. Superior shopping and delivery experience- driving consumer delight and repeat buying. “Driven by their sharp advertising, robust offers and flawless execution, e-tailers have managed to largely match their pre-sales expectations and deliver the biggest sale period ever for e-tailing industry. The high-quality experience of all stakeholders involved in this event indicates the growing maturity of the e-tailing sector and sets up a strong base for enabling robust growth for the sector in the upcoming quarters,” RedSeer analysts said.